At lunch yesterday a colleague asked me what I thought about ‘Resilience’ as a alternative term for sustainability. I responded that I was still trying to figure out if I liked ‘Flourishing’. But I had no doubt at all about a term I coined myself recently – ‘R-R- Redundancy Avoidance’. First, a definition. R-R- Redundancy is what lets me close my apartment door and ‘flourish’ without speaking to my neighbors behind all the other doors down the sixth floor hallway of my Upper East Side co-op for an entire weekend or week if I choose. That’s because in my large one-bedroom apartment (neatly divided into six ‘rooms’ – living room, dining room, kitchen, bedroom, office and bathroom), I have what real estate agents refer to as all the amenities – the kitchen with the gleaming white Whirlpool fridge, the GE stove and microwave, the black ‘Alfredo Accu-time’ toaster oven, the Krups drip coffeemaker with thermal carafe, and the Whirlpool ‘QuietPower3’ dishwasher. In that same apartment are not one but two TVs with remote controls (which I sheepishly admit to running simultaneously when I’m cleaning), a Marantz stereo system with two sets of speakers (one set for the bedroom, the other, the living room) and two Panasonic DVDs and VCRs, one set for each TV. Then there’s the three Apple MacBooks in the ‘office’ — one for me, one for my assistant and a more or less retired spare. We also have an old HP Laserwriter printer, an old Brother fax machine, two GE landline phone sets, a Panasonic cordless phone, and an Apple iphone 4. And just recently when the printer started to act up and the copier died, we got a brand new Brother MFS MulitFunction Center which houses a color laser printer, fax, copier and scanner in one. In the linen closet, nestled within the sheets and towels and assorted household ‘stuff’, there’s an $850 Electrolux canister vacuum-cleaner with any number of plastic-y attachments I’ve yet to use. There’s also a spiffy Norelco ‘Ultima 80’ iron that whistles when I’m away for it for too long, and an ironing board with a really nice cotton cover with a pocket underneath that allows me to store an ironing cloth. It’s not relevant that the fridge isn’t a Sub-Zero, the TVs aren’t high-def flat-screens mounted to the wall, or the coffeemaker isn’t a Keurig one-cupper. I think you’re getting the picture. And things would be ‘worse’ if I owned a car, a boat, and a weekend place in Connecticut. Suffice it to say, for global comparison, I’m one person and despite my best efforts to live simply, I’ve got a lot of stuff. Trouble is, all of my neighbors behind those eleven doors down the hallway have exactly the same things, as do all the neighbors on the other twelve floors in our building. And some of them not only have Sub-Zero fridges and wall-mounted TVs, they also have a car — likely a Mercedes or BMW — in our building’s garage, a weekend place in Connecticut, and/or an apartment in Florida with a matched set of the exact same amenities. Most of us Americans haven’t given a moment’s thought to any of the implications of owning all of these sometimes multiple possessions in every home across our land, their embodied materials and energy, the space the vacuum hogs on the floor of the linen closet, or the time involved in shopping, maintaining, and repairing them. Not because they are selfish or mean. Not because they believe they ‘worked hard’ for them. But because owning a full complement of possessions behind one door (or under one roof) is part of our consumerist society. We value independence from tyrants and zealots as well as from neighbors bearing empty sugar bowls. Now that I’ve awakened from my independent possession-owning-maintaining-inventorying stupor (and in a city and country where the costs of doing same are starting to escalate), I’ve started to take some steps to avoid r-r- redundancy in my own life. My next door neighbor, Marlene gets the Wall Street Journal and I get the New York Times delivered each morning. 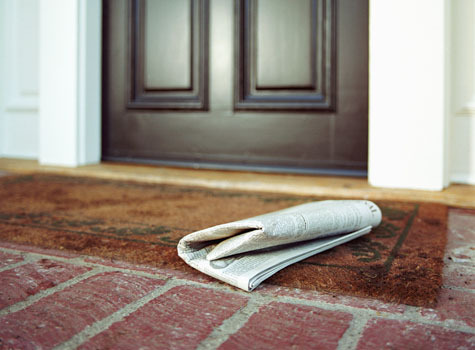 As soon as we’re finished reading them (usually by 9 am), we simply open our doors and with one flick of our wrists, toss our papers in front of the other’s door. (Sometimes I add a stage whispered, ‘Paper!’) in case she’s sitting, per usual, at her desk just inside.) It might have the occasional article clipped out, but heck, the price is right, and the convenience can’t be beat; and of course, at the end of the day, it saves a heck of a lot of paper. Today I took an extra step. I left my newspaper down on the coffee table in our lobby — a large, comfy space used mainly by real estate agents and their clients, and shareholders’ occasional guests. Fingers crossed that the shareholders themselves might take a seat during their comings and goings, read a free newspaper — and actually enjoy the space. It hasn’t happened in the 30-years that I’ve lived in the building, but of course, anything’s still possible. Jacquie’s take a book, leave a book. One ‘garbage night’ ten years ago, my equally green-aware super and I dragged in an abandoned shelf system from down the block, and instantly set up a ‘Take a Book, Leave a Book’ in our basement laundry room (the laundry room being a good, albeit passive source of r-r- redundancy avoidance thanks to building codes). Now neighbors (some of whom likely never met) anonymously exchange books, enhancing each other’s minds, lives and pocketbooks. With space so tight in NYC apartments, why not share the vacuum with a neighbor? Every other Friday morning, my neighbor’s housekeeper knock on my door, looking to borrow the vacuum. I learned from my Bissell client that the average vacuum cleaner is used for 20 minutes every other week. (Because of this, vacuums use so little cumulative energy, another client, Energy Star doesn’t even have a rating for them.) Given this, just one vacuum cleaner could literally rotate through every apartment in my building every two weeks with nary a dust ball in sight. Now that I’m getting into this, I can’t help asking: What other opportunities await for high rise neighbors to reduce r-r- redundancy by sharing, borrowing, and lending beyond the proverbial cup of sugar? Instead of 2 TV’s on at the same time, you could put on headphones/earbuds and listen to music. Just a thought. I love the concept of sharing within tall high-rise building communities: it makes perfect sense! Love the ideas in this article. 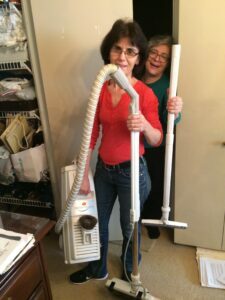 The sharing closet reminds me of college days, Life was simpler then and there was neither room nor desire for redundant appliances.We got along just fine by sharing, As adults, how often does one really need a vacuum in our small NY apartments, especially those of us without kids and pets? How many clothes even require ironing these days? I became acquainted with “take a book, leave a book” many years ago in my corporation (of all places!). I either participate in these programs or donate the books I don’t want to keep to friends or charities,These sharing programs should definitely include CDs and DVDs. If any room can be found, maybe we could even have a movie room. This would help in getting people to know each other as well as to reduce the number of duplicate DVDs in the building. The more I get rid of, the happier I am. The sparer my home, the more clearly I can think. Thanks for the trip down memory lane. Our college house had a closet on every floor with iron and ironing board, vacuum and cleaning supplies. Of course, we were quite homogeneous, and you could trust everyone to put things back, keep things in order, etc. I suspect such a closet in multi-unit apartments would need to be managed by a third party — a Home Depot? Bed Bath and Beyond? or a managing agent looking for incremental income? In the meantime, I’m willing to lend my vacuum to anyone who cares to ask. A friend has lived and worked for an international organization in Switzerland for at least 20 years. During a recent visit, we asked him what he saw as the main difference between life in Europe and North America. He replied that life in North America is based on having a much greater quantity of material goods. Here, we think nothing of multiple TVs, multiple computers, multiple vehicles, etc. Their family has one car and a camper/caravan for vacations. He must rent parking spaces for both. Jacquie, you are very right. I immediately thought about problems with “governing the commons” when I read this. But, I agree this is a unique, potential business! 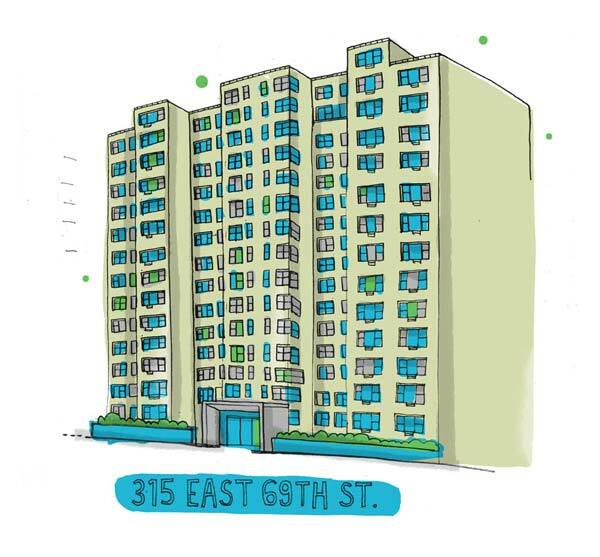 Regardless, gave me lots to think about for my own NYC apt building, thanks! Jacquie, Great post! I live in a neo-traditional neighborhood where we have shared green space and mail kiosks so people have to get out of their houses to walk and hopefully to chat. 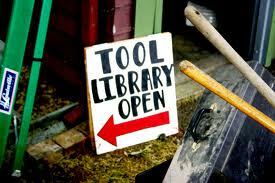 I’ve often thought there are more opportunities for sharing like a tool trade. Think about how many lawnmowers there are here! We share tools and freezer space with our neighbors, but I’d also be interested in developing a community solar array so we can share clean energy. I’d love to see developers building more of the sharing community into their plans. 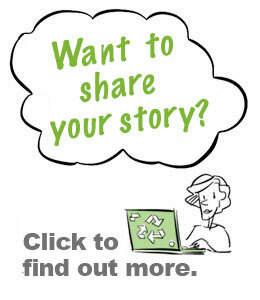 A lot more sharing could be enabled if it were actually designed in to a building (Think: Laundry rooms). My little sharing closet needs to be designed in, as does any type of community dining, sun roof, party room, etc. — the kinds of rooms and space that would allow us to have smaller aprts to begin with. I believe this is the premise of eco-housing, something I’m starting to look seriously into. Jacquie – as I am reading for the 10th time about the “tragedy of the commons” in my environmental science class, this post helps me break through the cynicism to imagine the potential of the “joy of the commons,” as I would like to call it. 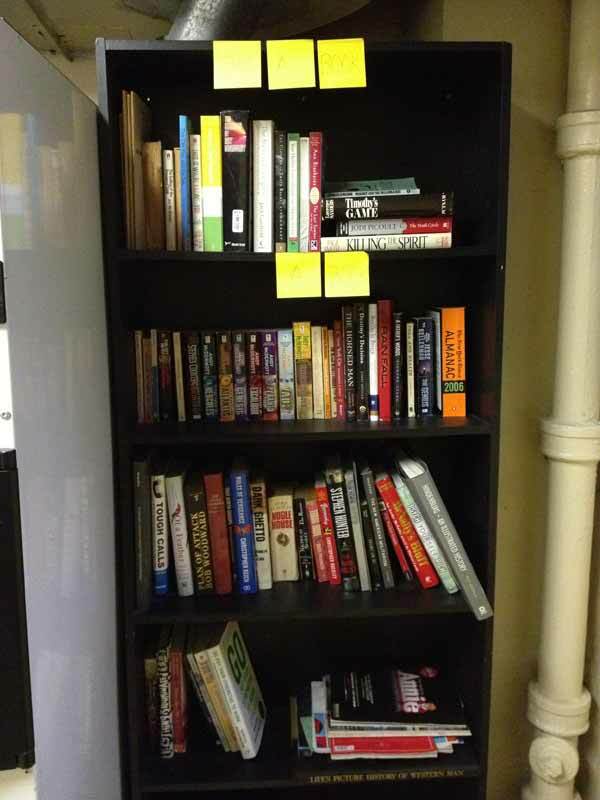 Not only do your ideas for a communal bookshelf, or even one day a communal appliance room, have great environmental implications, your plan to eliminate redundancy could have some serious social effects. Maybe, in a month from today, you could know how your neighbor takes his or her coffee, or the man on the first floor’s favorite brand of popcorn. I love this concept. I made a great friend by sharing laundry detergent freshman year of college. The possibilities are endless – and not friend-less! I am intrigued by the idea of how this could play out in a high-rise building – please keep us posted. As a recent college graduate, I found it incredibly helpful to have shared brooms, microwaves, and laundry rooms within each of our dorms. Now that I have been exposed to a different college campus and learned that each floor or building does not offer these amenities, it is much more difficult to find someone who has a broom to borrow, for instance, let alone frustrating. The greatest amenity of all was the “free bin” in the basement of each dorm. There, we would place our unwanted clothes and small items and others would take what they wanted. At the end of the year, it would all be donated to Goodwill. Yes, the collecting place was usually messy due to the “tragedy of the commons” philosophy, but overall, the idea of not having to buy a few new pairs of jeans and dresses was fabulous for our tight budgets and for reducing transportation or shipping environmental and financial costs. 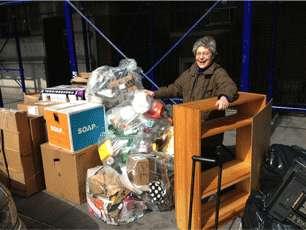 Jacquie – I love the idea of a lending library for appliances. 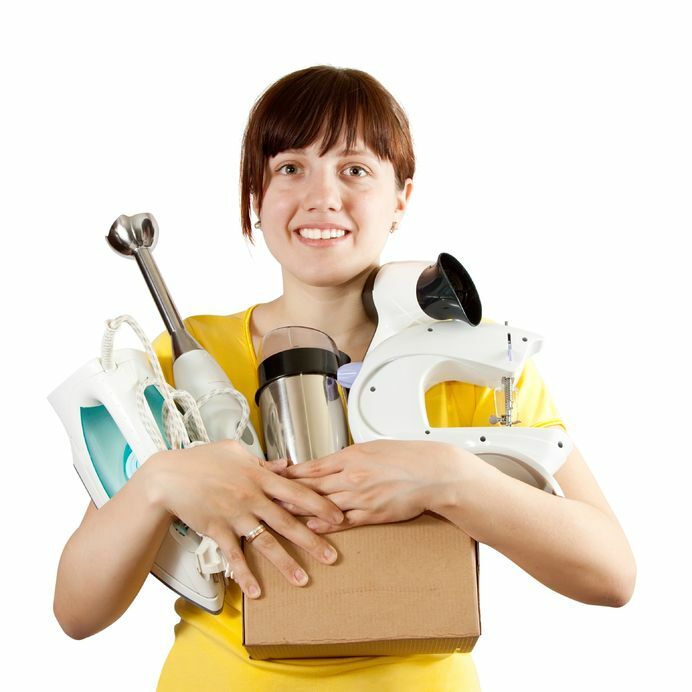 Neighborgoods (http://neighborgoods.net/) is a platform that sort of fills that gap by providing an online platform to lend out your stuff to neighbors and friends. Need a ladder? Borrow one! Got a sewing machine sitting in the closet? Let people know it’s available for use! Now just for a way to integrate that into a single building…maybe an iPad (or other) display in a building lobby that shows all of the things in the building that are available for share? Woah, what a great resource, Jeremy. Thanks for sharing! Jacquie, I love this idea about sharing minimally used appliances. I am going to start offering our rarely used vacuum to our downstairs neighbor now – what an excellent way of building community. Love your idea about the note in the lobby indicating what all was available to share. I like the idea of the ‘utility closet’ in the hallway, but actually a ‘virtual closet’ indicating what all items are available makes eminently more sense. I like the way you think! Evidently “resilience” is not an alternative for “sustainability.” Resilience in the current vocabulary has become associated with the post hurricane Sandy awareness that we are living in systems that are so interdependent that we have no resilience if disaster strikes. With the new FEMA flood maps, now 70 million live in flood zones, and resilience of the infrastructure necessarily means they need some redundancy to be able to survive floods. If a building is over 50% energy independent, it can likely at least survive for days off the grid. Plus in serious flood zones alternative, resilient, solutions for sewage need to be found. So resilience comprises the total of measures that helps survivability. In this context, well designed redundance is a positive. Accordingly, I think that redundance as used in the above article really means dysfunctional duplication. But we have to be careful there also. For example, in the era of bedbug infestations, sharing vacuum cleaners may not be a great idea, even more so when they are bagless vacuums, which are known to become breeding grounds for bugs. Even worse, Dyson has told me that their mechanisms could be damaged by the bedbug shells, and/or the diatomaceous powder, which is one of the best protections against bedbugs. So the advice throughout is bagged vacuums, and if there is an infestation to dispose of the bags as soon as you vacuum. Another example where a seemingly wasteful practice is extremely useful. Obviously, I have dealt with a bedbug infestation in my building. I hear you on all three points, Rogier. In the aftermath of Sandy, the term ‘resiliency’ has taken on a different more immediate, storm/disaster related hue. It occurred to me after I wrote this piece that I might have been misusing the term ‘redundancy’, so I looked it up. Apparently first definition is ‘unnecessary duplication’ (which was my intention, of course) and the second was ‘backup systems’. So while a little ‘redundancy’ is helpful in an apartment building, “Can I put a few things in your freezer, mine just went on the fritz”, there’s such a thing as too much redundancy, especially when it comes to small appliances and such that are used infrequently. Thanks for pointing out about the issue with sharing vacuum cleaners. Like sharing luggage or bedding I presume, that is certainly a way that bedbugs can spread. I think the idea of ‘personal property’ has, in many ways, shaped the landscape of American life. Land ownership and material possessions signify not only monetary success, but also a sense of individualism and self-sufficiency that inspires others to try to achieve the same. The American Dream is, after all, a white picket fence – surrounding one’s land. The concept of ‘sharing’ challenges this sense of individualism and self-sufficiency. While pockets of co-operative-like housing operations have existed for many years, the transition to ‘sharing’, not only as a way to build community, but as a necessary solution to reducing resource use, is very new. This is especially true as we grow to realize that we ‘share’ the environmental impacts that our combined resource use is contributing to. Sharing closets and other neighborhood sharing programs seem like very effective ways to encourage, while not forcing, people to share. Many people are cautious of sharing with people they do not personally know, let alone people with whom they are not acquainted, so neighborhood programs would probably get more support and engagement. This is especially true with the ‘vacuum cleaner’ issue mentioned above, but less true with things like lawn mowers, irons, and so on. There is also a great ‘sharing’ movement going on in many European cities. Library-like stores offer everything from kitchen appliances to the occasionally used board games, that can be rented out by members who pay a small fee. This is great for things that people only use a few times a year or for special occasions. Virtual sharing and the sharing of ‘opportunities’ are also important to consider. For example, Netflix is a great example of virtual sharing, as people can virtually access a database of movies that are technically being shared with thousands of other people. Sharing ‘opportunities’ could be car sharing programs, or carpooling, which prevents wasted opportunities to use products to their maximum. Really great post! and thank you for getting me thinking more about SHARING. Very important points, Jacquie. I think this idea of redundancy applies the most to our culture’s adoption of consumer electronics. It also happens to be one of the fastest growing problems when it comes to both energy use and waste streams. There are very material repercussions for the digital ether that we have a tendency to think of as this limitless black hole of information. Data centers alone are adding huge loads to the world’s energy footprint. But e-waste (what all of this redundant equipment will eventually become) will be one of our country’s most important environmental tasks. E-waste represents the fastest growing waste stream in the U.S. 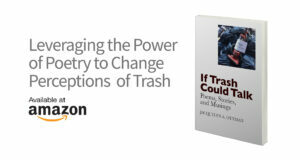 The EPA estimates that up to 80% of this waste currents gets exported to the developing world where its disposal is not only back for the environment, but damaging to the populations as well. Like you said, Americans conveniently avoid thinking about these repercussions as electronics dumps in Cambodia or India don’t seem to make it on to warning labels on the side of the box. Hopefully we can move to pair down these kinds of redundancies and couple that with companies that make products more easily dismantled, last longer and are more easily upgraded. On the subject of e-waste, Tyler, I now have a wish: what if apartment buildings had such great “Media Rooms” where the TV/Internet watching was so great you didn’t have to have your own equipment. Would help create community as well. I know a lot of lobbies — including my own — that could fit that bill! Per the above, I’m patient. I was taught that cities are the greenest places to live, a notion that surprises a lot of people. However the idea is a lot like what this article preaches; the more people share, the less waste we create. The best example is how well we have made public transportation work in cities! So, I think if nothing else, that is a great starting point, show people how much they are already sharing and then suggest little things after that. I also wholly agree with the commenter earlier who talked about the systemic nature of this problem. There is a great documentary called “Affluenza” which along with The Story of Stuff is a must-watch for anyone who cares about the waste in our society. The r-r-redundancy is absolutely r-r-ridiculous! My boyfriend and I dream about our life together often, and we decided a long time ago that we would not be like his parents! He comes from a large home where the two-car garage can no longer fit a single car, the loft and storage rooms are packed to the gills, and there are more TV’s than people. The waste of resources and money that was spent on all the stuff only added to stress, disorganization, and clutter. If there is one thing I learned is that simplicity is freedom. The more stuff you have, the more time you spend taking care of your stuff instead of taking care of yourself and being with the people you love doing the things that you love. Sharing a vacuum is genius and I wish I lived in an apartment so that I could share books with my neighbors. Sharing is a great way to get rid of the things you only need on rare or special occasions, so why not take advantage of this waste reducing tip? I love it! I love the idea of reducing R-R-Redundancy through sharing. I thought this article about the economics of sharing was relevant: http://knowledge.wharton.upenn.edu/article/how-green-is-the-sharing-economy/. It points out that this idea of sharing in indeed being turned into a business by the likes of Zipcar and Citi Bike, but the exact economic and environmental impacts of these businesses are difficult to pin down. Of course, that shouldn’t discourage us from using these services or from starting our own! But it does mean that we should be thinking more about metrics to track what we are doing so we can live even more efficiently! On a different note, I love the idea of a communal closet, but the issue of accountability for loss or damage is certainly an issue. I think a common message board is definitely the way to go for this! Having something as simple as a Facebook group for the building where those looking to borrow something can post, and anyone with the item can reply might work well! Furthermore, meeting the person you are borrowing something from would introduce accountability for the borrower. I love these ideas of sharing appliances! Not only would this be great at reducing and reusing, but it also would be a great way to get to know your neighbors and create a sense of community within your living space! 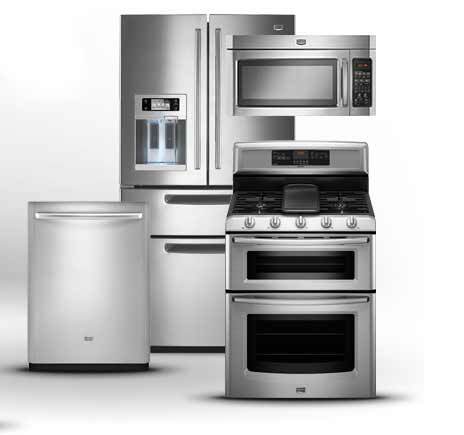 The idea of sharing appliances is a great one! Although some skeptics would say that sharing appliances require a great deal of trust, I feel as if that level could easily be built, especially since many people have experienced communal living. Communicating these ideas of sharing things would be great, especially for people who cannot afford the great number of appliances that our consumerist society convinces us to consume. However, as someone who currently attends college and has communal appliances, such as kitchen materials and vacuums, I think a big problem with sharing appliances among large groups of people is accountability, which goes back to trust levels. Convenience is also a big part of the problem, as people may want to use the communal appliances at the same time. Creating schedules for sharing may help with that problem. Asking college students and adopting communal living styles may help in R-R-Redundancy Avoidance! Perhaps more ways to participate in R-R-Redundancy Avoidance would be to utilize electronic sources of newspapers more. Electronic versions are available and allow everyone to use the same resource at the same time, all while decreasing the amount of paper wasted. For newspapers that require subscriptions, perhaps you can share with neighbors to reduce costs and make it more accessible to people who are less willing to pay those fees. Another way might be to not buy into perceived obsolescence – don’t buy new items unless your current one is no longer functional. Although the new one may be slightly more efficient, is it worth the money or the extra trash you’re producing? I never really think about how many of the items and products I own are used only once or twice in a few month period. So many of these items I could easily be renting when I need them or share among others that live near me. I also think it is extremely true how many of the same products people own. In my house in New Jersey, My family owns 5 TVs. I am sure we could survive with 2 or 3. Many of them are not even used on any given day. I know that my mom has about five different gadgets that all mix things which again maybe you could buy a product that does the mixing for all different types of items. I absolutely love the concept of “redundancy avoidance.” We live in a world where we utilize every-day items independently, but seldom share our belongings with our neighbors. It’s important for us to “share, lend, and borrow” more often and normalize this, instead of straying away from this culture. Furthermore, having more conversations about why we “share, lend, and borrow” is also important because it allows for people to realize that saving resources and energy will help save our community and our Earth. – I loved this quote. It appeals to people who would say “I worked hard for these items. I deserved them.” It also appeals to the other end of the spectrum, (“I am selfish by having so much”). You’re right; it’s less personal than that. It’s simply a part of America’s consumerist society. The ideas put in here are more likely for college students who save money by sharing subscriptions and textbooks and pencils and food storage, etc… to understand. But the fact that you make it anecdotal also helps appeal to an older generation, and I find that it is a very informative article. I wonder if there’s a way to apply these ideas to people who live in the suburbs or in different parts of the country, In more spaced out houses. Excellent post! After watching The True Cost and Minimalism on Netflix and reading up on the effects consumerism has on the environment as well as the people who live in devasted areas because of our insatiable quest to have the latest and greatest, I had to think twice about what I was buying. We utilize these everyday items without picking up our heads and connecting with those around us–i.e. our neighbors. You used simple and effective steps to avoid redundancy avoidance; ones that I plan on using in my own apartment building since it feels like no one speaks to each other. 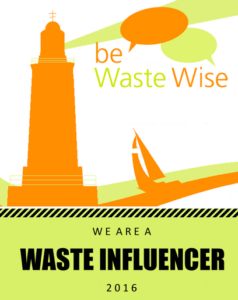 What you proposed not only cuts down on consumer waste but also builds connections and meaningful relationships.